Size: 377 sq.ft - 1801 sq.ft. 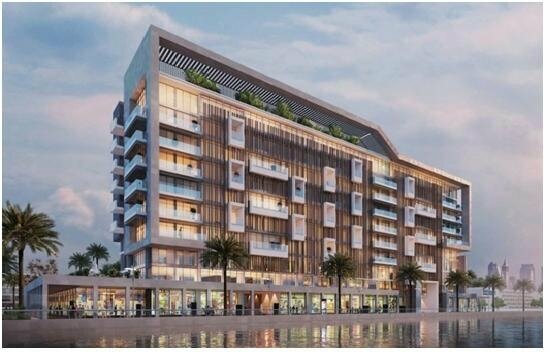 Azizi Riviera is positioned in the prestigious location of Meydan City by Azizi Developments. Riviera is set within a multiphase development is spread across four phases comprising 13 regions, a mega integrated retail district, four and five-star hotel and lush greenery. Riviera project at Meydan Dubai consists of total 35 towers that will offer a combination of studios, 1, 2 & 3 Bedroom apartments with fully equipped kitchens and fully furnished rooms. The 1stand 2ndphase of the project is expected to be completed in December 2018. Azizi Riviera grasps the new Riviera way of life situated in the City which never stops. The first phase of Azizi Riviera is set within 18 mid-rise residential buildings comprising of 2,273 units, a mega integrated retail district, waterfront views and lush greenery.Building 2 will have 29 two bedroom units and 19 three bedroom units. This particular unit is a three-bedroom apartment with one en-suite master bedroom. Studio apartment ranges from 377 to 611.50 Sq.ft, 1 BR covers are of 476.20 sq.ft to 1550.32 sq.ft, 2 BR apartments ranging from 779.85 sq.ft to 1749.80 sq.ft & 3 BR area size starts from 1767 sq.ft to 1801 sq.ft. Meydan is ideally placed just minutes from Dubai International Airport and DIFC. Azizi Riviera is easily accessible via Business Bay, Sheikh Zayed Road, Al Khail Road and Meydan Road. Well-connected with a proposed schools, hospitals, metro line, malls, cinemas, retail and other modern day to day necessities. The Meydan Hotel & Racecourse is a just five minutes away from the project location. It’s just a short walk to the canal with ample connections to public transport and water transportation. This is the ideal location to enjoy being a part of the Riviera community. Azizi Riviera is situated in Meydan City at Al Meydan Road, United Arab Emirates. The Riviera building is known for providing latest specification to its residents like Waterfall next to the pool, BBQ area, Garden area, Kid area, Gym, sauna, Yoga area kind of yoga garden, Long swimming pool close to Olympic size, Movie night area - which provides an outdoor special area with projectors. 770 sq.ft. - 1050 sq.ft. 377 sq.ft - 1801 sq.ft.